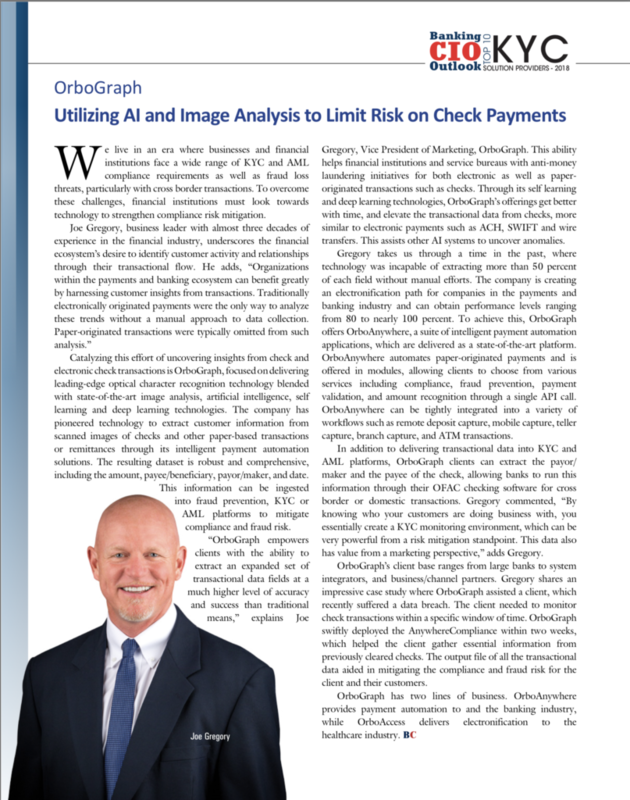 Our own Vice President of Marketing, Joe Gregory, is featured in an article in Banking CIO Outlook magazine (you can read the story here). OrboGraph is proud to be featured as one of Banking CIO Outlook’s Top 10 KYC Solution Providers for 2018. “Organizations within the payments and banking ecosystem can benefit greatly by harnessing customer insights from transactions. Traditionally electronically originated payments were the only way to analyze these trends without a manual approach to data collection. Paper-originated transactions were typically omitted from such analysis. Gregory goes on to explain how OrboAnywhere, our suite of intelligent payment automation applications, automates paper-originated payments. Offered in modules, it allows clients to choose from various services including compliance, fraud prevention, payment validation, and amount recognition through a single API call.